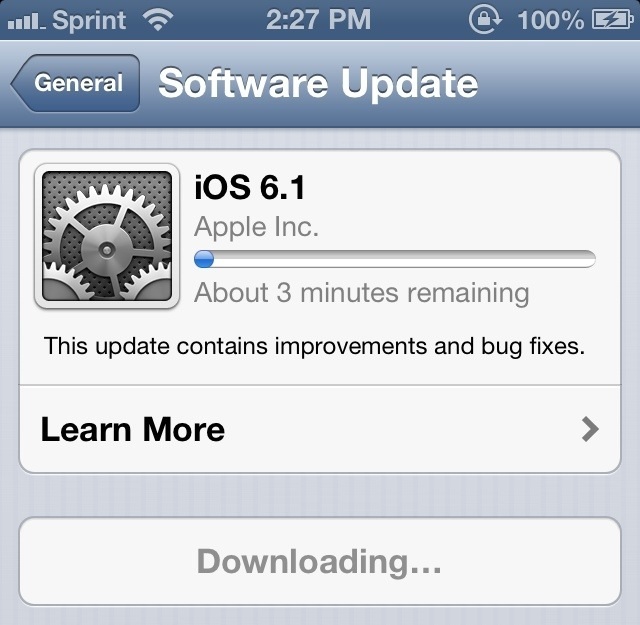 Apple has just released iOS 6.1 for iPhone, iPad and iPod touch. According to the release notes the main thing the update provides is LTE support for more carriers and giving Siri the power to make purchases. Siri can not buy movie tickets from Fandago if you live in the USA. If you have iTunes Match, you can now download individual songs from iCloud. You can download the update right now over the air. For the iPhone 5 the update is 107MB. If you don’t see it go to settings > General > Software Update > Download and Install. You can only download the update if you are on a wifi network. If you have Apple TV there is good news for you too. Apple TV now has Bluetooth keyboard support, Up Next, and makes better use of the iCloud service. UPDATE: MuscleNerd has confirmed that it is safe to update to iOS 6.1. So jailbreakers can go and update to iOS 6.1. Sunday may be Fun Day! ← Unlocking Your Phone Is Now Illegal.